Equipmentland is the leading online source for thumbs. We offer adjustable rigid (mechanical, non-hydraulic) thumbs, hydraulic thumbs, upgradeable-to-hydraulic thumbs, full-motion mechanical thumbs (Hoeclamps), custom thumbs and more. 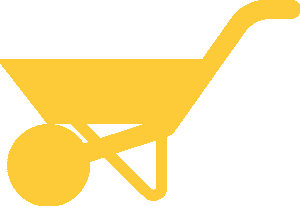 Available for most skidsteers, backhoes, mini-excavators and standard size excavators. All thumbs we carry are reliable thumbs from established US manufacturers. Some thumbs are in stock and some are bulit to order. Inquire how we can help get you outfitted with the best thumb fitted to your carrier. Note there are two basic types, “universal” thumbs with their own pin, and shared-pin style thumbs. In many cases it is possible to outfit your backhoe or excavator with extend-a-hoes with a thumb. Only a few manufacturers make thumbs for telescoping, or extendable inner stick backhoes. With the same basic features as larger excavator thumbs the Backhoe Thumb attachments will enable your backhoe to do more material handling jobs than ever before. Equipmentland has the widest selection of thumbs for extendable stick backhoes. 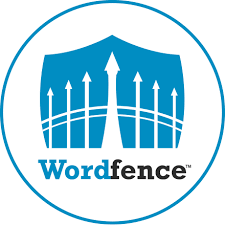 Whether you have an extendable inner or extendable outer stick, there is a model for you. Included are weldable models for outer stick applications, Hoeclamps and Bucket/Thumbs for either inner or outer extendahoes, the “Smartthumb”, and the new Quicktach/Thumb. Full-Motion Mechanical Thumb – opens and closes with bucket. The Hoeclamp a patented mechanical (non-hydraulic) full-motion thumb. 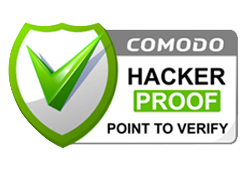 It utilizes the main pin of your bucket and installs in about an hour. Model specific for backhoes, mini and full-size excavators up to 30,000 lbs. For many telescopic sticks such as Ford New Holland, Komatsu, and older John Deere and Case models. Cat 420D models usually in stock. Especially good on John Deere MD45CW-11, 310, 410, C&D models, D-Series Cats and Kabota L-35’s. Stores out of the way on stick. Incredibly versatile yet relatively inexpensive. 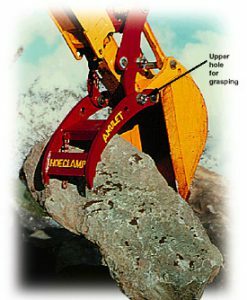 Like the thumb on your hand, the PowerClamp allows the excavator to grasp objects, making it an indispensable tool for demolition, land clearing, scrap handling, as well as log or debris loading. 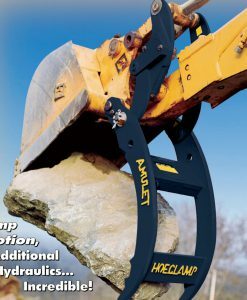 The Amulet PowerClamp increases your excavator’s abilities. 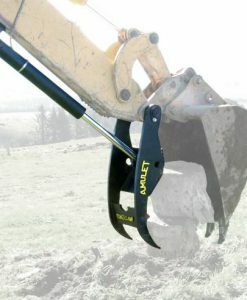 The Amulet PowerClamp hydraulic thumb for demanding jobs including, logging crews, general contractors and demolition professionals. Featuries heavy-duty hydraulic cylinders, low-wear serrated teeth and high strength steel alloy construction. – For Machine Weight of 80,000 to 110,000 lbs.